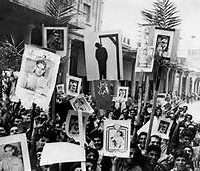 In 1958, the 14 July Revolution ended the thirty-seven-year Hashemite monarchy of Iraq in a coup d’état and established the Republic of Iraq. The Free Officer group, led by General Abd al-Karim Qasim and his associate Colonel Abdul Salam Arif, was inspired by Pan-Arab nationalism and Nasser of Egypt’s 1952 overthrow of the Egyptian monarchy. Like some other Iraqis, the Free Officers were frustrated by Western, particularly British, influence on the country. 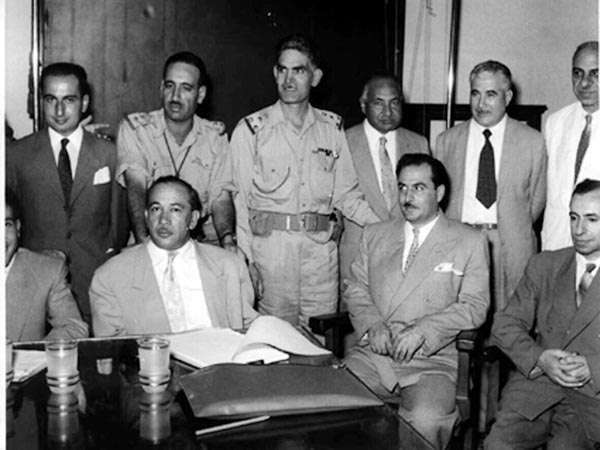 The UK and U.S. supported the creation of the Baghdad Pact between Iraq, Iran, Pakistan, and Turkey in 1955, which was seen as aggressive by Egypt and was resented by many Iraqis. This grievance was exacerbated in 1956 when Iraq’s King Faisal II supported the British invasion of Egypt during the Suez Crisis. On the morning of July 14, Colonel Arif marched the 20th Brigade into Baghdad and took control of the radio system, using it to publicize the revolution. Troops were sent to assassinate King Faisal II and Crown Prince ‘Abd al-llah as well as other members of the Royal Family. 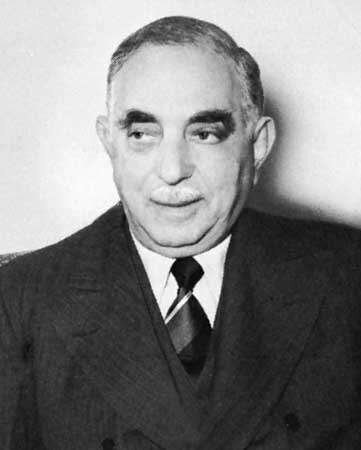 Prime Minister Nuri al-Said disguised himself and escaped, but was found on the street the next day and also assassinated. General Qasim (in photo below, with Colonel Arif) was named the new prime minister and a new government structure was instated in the following weeks. Mass rioting following the coup created a dangerous situation for foreigners in the city, resulting in the deaths of three American citizens among others. The U.S. government feared for the stability of other allied Middle Eastern regimes. Morris Draper was serving in Baghdad at the time as a political and economic officer on the Baghdad Pact Secretariat. In an interview by Charles Stuart Kennedy beginning in February 1991, Draper discussed the events of the 14 July Revolution, the experiences of American embassy personnel, and his impressions of its causes and aftermath. You can also read about how the U.S. stuck with Maliki and lost Iraq and other Moments on Iraq. DRAPER: There was still a Jewish community in Baghdad; some were quite well off. During the first week I was in Baghdad, the patriarch of the community was stuffed up a fireplace. There was a lot of that sort of violence, particularly between religious groups. The Shi’as, who were the majority, would hold one of their religious holidays, violence would break out and there would be demonstrations. The Sunni, who were the ruling group, did everything they could to humiliate the Shi’as in all sorts of ways. They would call dogs “Ali” or “Hassan” who were the Shi’as main prophets. Then there were the Kurds. I got to know quite a few of them. Many of the Christians who lived in my neighborhood were strongly opposed to the regime and it would not be uncommon for people to be put in jail, have relatives tortured and be challenged in various ways. There was a lot of resentment brewing against the dynasty among the educated; there was a pervasive opposition to the remaining forms of British colonialism; for example, there was considerable resentment of the British ambassador, who sort of operated as if he were a proconsul. So there were a lot of seething undercurrents. I would say that in the Western community–the British, French, Italians and others– there was a feeling that Iraq would come through its travails quite well because they were spending money on social services; they were not trying to build up their army–in fact, they were keeping their military services deliberatively small–many institutions had been established by the British which had been maintained; there was even a minor kind of representative assembly, which followed the dictates of the ruling group but was nevertheless symbolically important. There was even an embryonic beginning of political parties. A couple of our embassy staffers thought that the regime was living on the brink of disaster. One assistant military attaché predicted correctly that a revolution or an outbreak would occur in the summer of 1958. Another officer, a member of the United States Information Agency, from his contacts with journalists and the art community, also predicted an overthrow…. Q: Who was challenging the regime? DRAPER: They were many secret groups in the military in particular. Many were followers of Nasser of Egypt. There were nationalists who felt humiliated by what had happened to the Arab world in 1948 and 1956–the wars against Israel. Of course, the Iraqis had a longstanding tradition of opposition to anyone in power. It took the British a couple of years during World War I to get the Iraqis under control. In World War II, Iraq was the scene of a rebellion and provided sanctuary to the violent anti-British, pro-Axis Mufti of Jerusalem. So Iraq had a history of anti-attitudes. When the revolution occurred, it took place because the prime minister–the strong man–let down his guard for the first time in his history and allowed a unit of the Iraqi army to move through Baghdad along with its ammunition trucks. This is the first time such a thing had happened in forty years and that army unit immediately proceeded immediately to the radio station, to the Prime Ministry, the information department and the Palace and took over…. 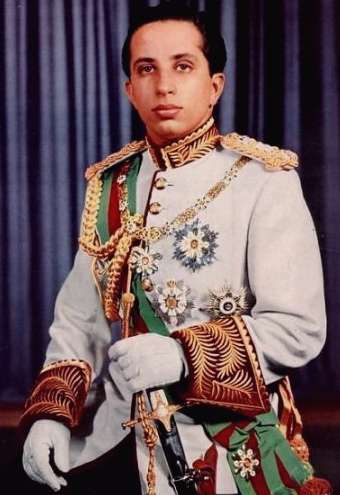 The King [Faisal II] was very young and weak. His uncle was generally considered the mastermind. There is a general weakness in the Hashemite family in any case which shows itself in various ways. The revolutionary group found a lot of photographs of the King in compromising homosexual positions. They used those photographs to great advantage to convince the conservative clerics especially that the monarchy deserved to be overthrown. They also hurt King Hussein of Jordan because he couldn’t mobilize support for the Hashemites as he wanted to do. So in the end there very few tears even by the former supporters of the monarchy. ([Prime Minister] Nuri al-Said was another matter. He was well respected). The King was clearly out of touch. I would occasionally attend the Assembly which was almost a joke. Nuri would not permit any opposition or criticism in public and he used rather ugly means of controlling various groups. A critic started to speak but he would be drowned out by cat-calls from Nuri’s faithful. The Assembly was largely a facade. Nuri was an old man by this time and didn’t interest himself in day-to-day developments. He didn’t have his finger on the pulse. But he was recently austere; he was not a disgrace. 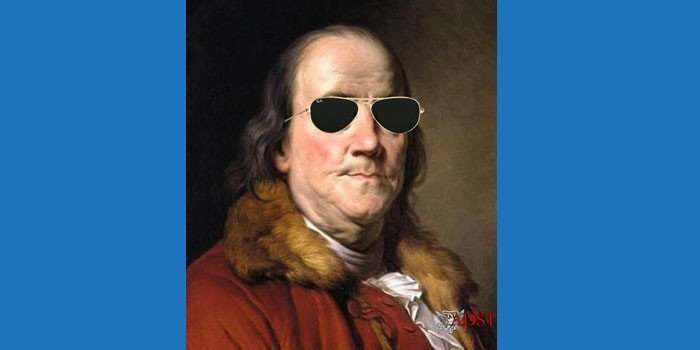 When the revolution occurred, he disguised himself as a woman and survived a couple of days before they caught up with him. He ended in a rather violent death, being dragged through the streets. There was a division in the embassy between those who predicted an early overthrow and others who felt the situation being relatively stable. The Ambassador, Jack Jernegan or his predecessor, Waldemar Gallman, was undecided. Some of the senior officials were far too complacent. They seemed that way even at the time. They were out of touch. A lot of us younger officers felt that we had a better feeling for the society because we were out in the countryside, talking to everybody from archaeologists to reporters to soldiers to shopkeepers. Some of our senior officers only talked to other diplomats or senior Iraqi officials of the establishment. They were never seeing a cross-section. That is always a danger for senior officials anyway. They didn’t take trips and see the whole picture. We, of course, saw it more clearly when the revolution came. You wonder why one didn’t see it sooner. But it is very hard to predict such events in some societies. For instance, if an American goes into a market and gets spit on, you know something is brewing. But in many cases, as diplomats, you live a protected life even when we are strolling through the market. Q: Tell us what happened on July 14, 1958 and thereafter. DRAPER: [Prime Minister] Said (at left) allowed an army division to move through the town for the first time. Baghdad is like Paris in that if you want to get from one part of the country to another you have to go through the city. This time the division was allowed to carry its ammunition with it. So it took over the government at about 3 or 4 in the morning. Many including myself heard firing; that was not uncommon in Iraq, but this sounded somewhat more intense. Many of ours were awake. I was to take an Iraqi airline flight to London later that day for a conference. One of my colleagues drove out to the airport thinking that if there had been a revolution, the airport would have been taken. Strangely, it had not happened for many hours. So he returned at 6 a.m. and drove into the embassy driveway, when his car stalled. A stray bullet had gone through his radiator and the water had run out. All our normal contacts were unavailable or hard to find, but much of the embassy and the Baghdad Pact Secretariat felt that something was going on, although none of us were sure what it was. Most people thought it was another palace coup which probably would not succeed. In any case, I went to the airport and I tried to find out from people I knew there, including the pilot of the plane, what was going on. There was military presence at the airport. I had driven near the Presidential Palace, but by this time all of the killing had taken place. So I got on the plane to London. After an hour, while flying over Turkey, the crew came back and explained that they were being ordered back to Baghdad, but the captain refused to do so. He wasn’t sure he would survive if he returned. He didn’t really know who they were. General Sararef [the leaders were General Abd al-Karim Qasim and Colonel Abdul Salam Arif] who led the rebellion was not well-known in Iraq; no one was quite sure what would happen. It could have been a plot inspired by Nasser, but no one knew. In London, there was a major meeting of prime and foreign ministers and others including [British Prime Minister Harold] Macmillan, [Secretary of State John Foster] Dulles and [Prime Minister] Menderes of Turkey. Iran was there but no one from Iraq. There were a lot of intelligence people because at that time there was an informal network of intelligence people from Iran, Turkey and Israel. That dissolved in that year. Menderes felt strongly that it should be preserved and in the final analysis, the decision was reached to maintain the alliance without Iraq. Its headquarters would be re-established in Ankara as CENTO. It was essentially a decision to save face because everybody knew and almost admitted in so many words that the organization was just a facade. But the Turks felt very strongly and also the Iranians felt that you needed a bulwark against the Nassers of this world. All embassies in Baghdad were still operating and sending communications about what they saw. They described what had happened–the rioting. When you organize for a crisis you can collect considerable amount of information on personalities. By that time, we knew which army division had been involved. All our military attachés knew what the division size and strength was. We had learned a lesson when Nasser had come to power because the group of officers who took over the Egyptian government did not reveal who the true leaders were for a long time. We didn’t know for about six months that Nasser was the genuine leader and that Naguib was only the nominal leader. We learned our lesson from that. So by the end of the first day, we were pretty certain on what had happened and who was in charge. There was never any question of intervention. The only question to be resolved was what to do about King Hussein of Jordan. We felt that his regime was threatened and that was one of reasons later on, in connection with the Lebanon issue, that led the British to send troops to Amman. Q: There was a story about one of our officers trying to get his family out. Can you tell us that? DRAPER: That was horrible. He was a communicator and came to duty early in the morning, about 5 or 6 o’clock. He heard the shooting and decided that he better return to his house to get his family. They lived across the river close to the Presidential Palace area. So he did that, collecting his wife and three children and as he was driving back to the embassy in his car, he had to cross a bridge that had been bombed in the fighting then going on. The traffic was stopped all of a sudden; he heard rumbling and soon he saw a huge crowd trying to cross the bridge leaping from car to car. 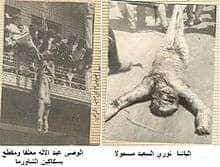 They were dragging with ropes some people they had killed. So the crowd jumped on his car, hundreds of them, smashing it. The kids had a picture of sheer horror and the family was thoroughly frightened. Scenes like that were repeated regularly and went on for months and months. Property was destroyed, usually by younger people. We evacuated all embassy dependents; the embassy was taken over by the Iraqis. They did not occupy the building, but had a tank out front pointing its gun at the building. They were obviously trying to intimidate us; they tried to stop us from communicating by radio. They generally harassed us. We decided we just couldn’t keep the embassy at the size that it was; so we evacuated a good number, including myself…. The number two in the embassy derided some of the ideas of the junior officers when they reported that trouble was brewing in Iraq [prior to the revolution]. He refused to believe it and was very insulting in staff meetings when he would shoot down this theory. He of course turned out to be wrong. The more junior officers had been prescient. He was also remarkably insensitive. After the revolution and the Iraqis were harassing us; they surrounded the embassy and caused all sorts of problems. When our dependents were leaving, the Iraqis were particularly difficult, trashing suitcases and behaving in a very hostile manner. They were atrocious to the women and children. In any case, the number two lived in a large house on our compound, separate from our chancery and the Ambassador’s residence. Many of our embassy people had crowded into the chancery, sometimes living in very close quarters, eating out of cans and have rare showers; nevertheless, the number two man and his wife lived in lonely splendor in their house, living as if nothing had happened. They showed absolutely no interest in the rest of the staff; it was an appalling show of insensitivity. Fortunately, there aren’t many of that type in the Foreign Service. The number two job in Baghdad seemed to be held by a succession of people who seemed to be made of the same mold. The predecessor and his wife of the person we are discussing used to inspect the fingernails of the Americans coming to their parties…. There was a fight for power among those who took over. There were also other groups throughout the country who were vying for power, including the Baath factions. At the time, we had not quite focused on the character of some of the new rulers. They were erratic. We had difficulty therefore in determining our courses of action. In all cases, even a regime of a repulsive dictator, you should try to communicate. You have to establish something and know what direction the regime might be taking. That was very difficult in Baghdad. In later years, there were terrible fights and coups in Iraq at about the same time that the Syrians were going through their bloodless changes. The situation in Baghdad didn’t settle down until about 1968 or ’69 when the present Baathist party, aligned with the military, took control. The situation was very unstable. I mentioned that the development experts were happy with the pre-coup situation in Iraq. The upheavals in Baghdad brought the whole program to a halt. Major development programs were abandoned for few years. The money went to the military forces. The Iraqi had seventy divisions facing us in “Desert Storm.” Prior to the military takeover, there were something like six divisions. The Iraqis kicked out Parsons and Co. and the other major construction firms that were working in the country. They treated Parsons so badly that the company said it would never return. People were arrested, jailed and tortured. Plans were discarded; a lot of dumb things happened. We had an experimental farm testing dry soil farming, managed by one of our universities, which the Iraqis completely destroyed. There were something like twenty generations of plants growing; that was a lifetime’s work. The new rulers were a combination of pure thugs and some ideologues. One of the first things the revolutionary group did was to give all the students passing grades from high school on up, regardless whether they took a test or had done acceptable work. The students were demanding it. They were demonstrating in the streets all the time. That is sort of self-defeating, but it is what happens. The regime was appeasing one group after another. People did learn to survive under this stress, even when a new security apparatus was installed with new rules. Groups vied with each other; in the military, there were wholesale retirements and discharges of officers who were viewed as disloyal. The same process took place in Egypt, except there it was done without violence. When there is a change of government, even in democratic states, different leadership emerges; in Iraq and other dictatorships, there are continual changes as stronger and stronger leaders emerge and succeed each other. 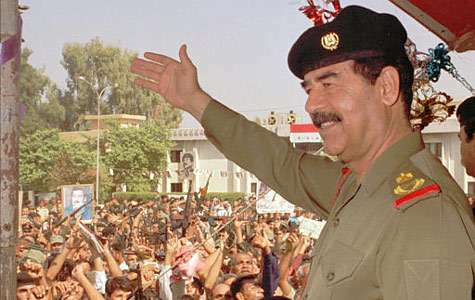 Saddam Hussein himself was preoccupied in the early years in trying to bring [Colonel during the revolution and later President] Arif down. He was the bully for his cell of the Baathist Party. The Party was organized in cells in the same way terrorist organizations are. This means that sometimes a cluster of cells can organize and not have the slightest idea what other clusters might be doing. I don’t think what happened in Iraq is necessarily a model for any other revolution…. After all it took about ten years for stability to be restored in Iraq. By 1968, the Baath Party, together with the military, was in power; interestingly enough, it was Saddam Hussein and others in the Party who re-embarked on the development track with some success. There have been a lot of Iraqi achievements that have been commendable. All, of course, has been destroyed in the last month [February 1991] or so.